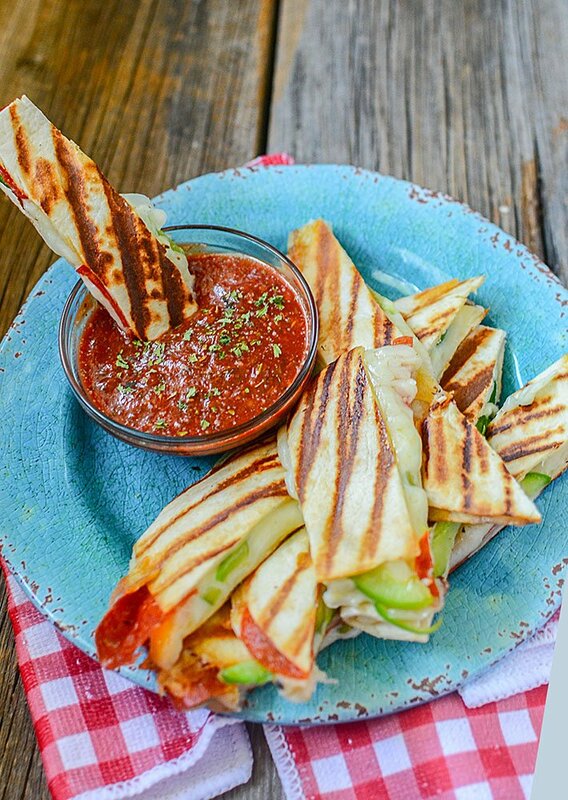 Want to Jump to the Recipe for the Ooey Gooey Cheesy Pizza Quesadilla Sticks now??? Click the button below!! 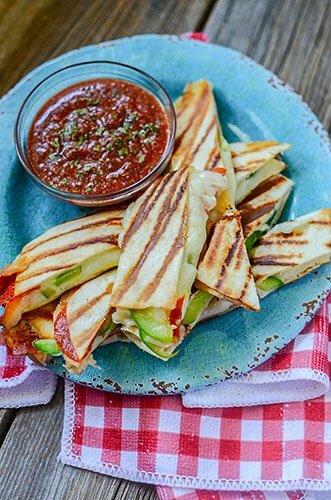 OOEY GOOEY CHEESY PIZZA QUESADILLA STICKS!! These are crazy simple to make. So simple really that it seems something that tastes this good should be harder to make. But it’s not, and because it’s so simple, it will be a “go to” recipe that you make all the time. I’m sure you have the ingredients in your pantry now. Of course, tortilla’s, cheese, pizza or marinara sauce, cheese, pepperoni, cheese, sweet peppers, and oh, did I mention cheese? You can make these awesome little snacks in any you want really. Whatever you like on a pizza – put it in this quesadilla. 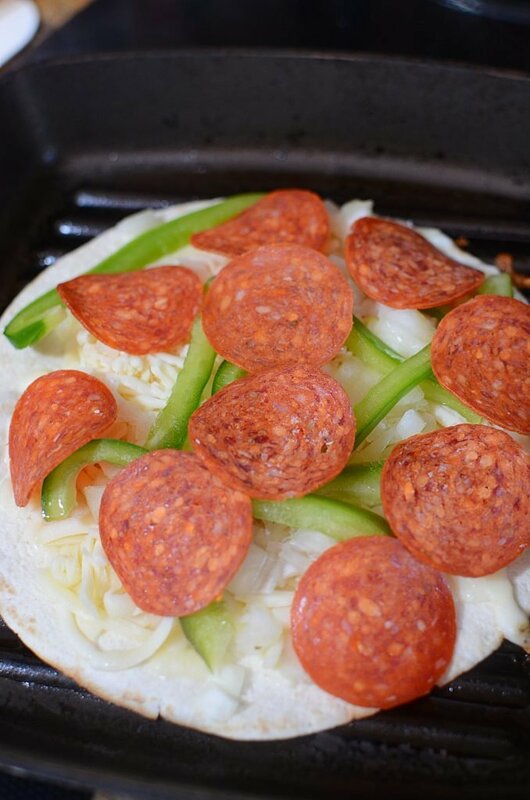 Hence.. you know… the name – the pizza quesadilla. Let’s just take a moment and explore some fillings/toppings, shall we? One of the best things about these cheesy pizza quesadilla sticks is that you’re not eating the heavy crust that makes you nap for 3 hours after you eat it. The tortilla’s crisp up nicely, so you get the crunch in the bite, and they serve as the perfect vessel to house all the ingredients from the plate to your mouth. PLUS, these hold up incredibly well to DIPPING. And you know you just have to dip these tasty quesadilla sticks. Making Cheezy Pizza Quesadillas Couldn’t Be Easier! Ok, so if you have a grill pan, ideal!! If not, no biggie, just use your favorite frying pan. The grill pan makes pretty grill marks on the tortilla’s but the marks are not integral to the yumminess of the dish. So you simply take one 6 – 8 round tortillas. 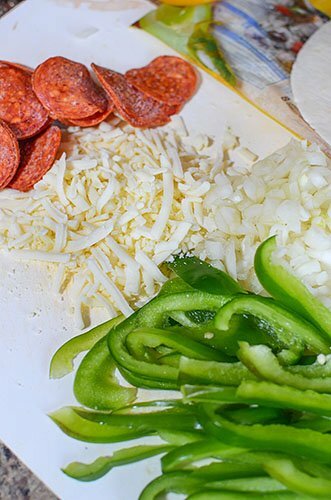 Place your cheese, pepperoni and green pepper on the surface. Place into a greased/sprayed with non stick spray, grill pan. Take another tortilla and place that over the top. You want the heat to be a medium heat, so that while it’s toasting the tortilla, it’s also melting the cheese and making the pepperoni nice and cooked. When you have some great color on the tortilla, using a large flipper/spatula, CAREFULLY flip the quesadilla over to the other side. This is the trickiest part as you want all the filling to stay between the tortilla’s and not fall out on that pan. This is why you want a lot of the cheese already melted so that it makes everything stick inside. Cook it on the other side until you again, get some nice toasty grill marks. Remove from the heat and transfer to a plate. 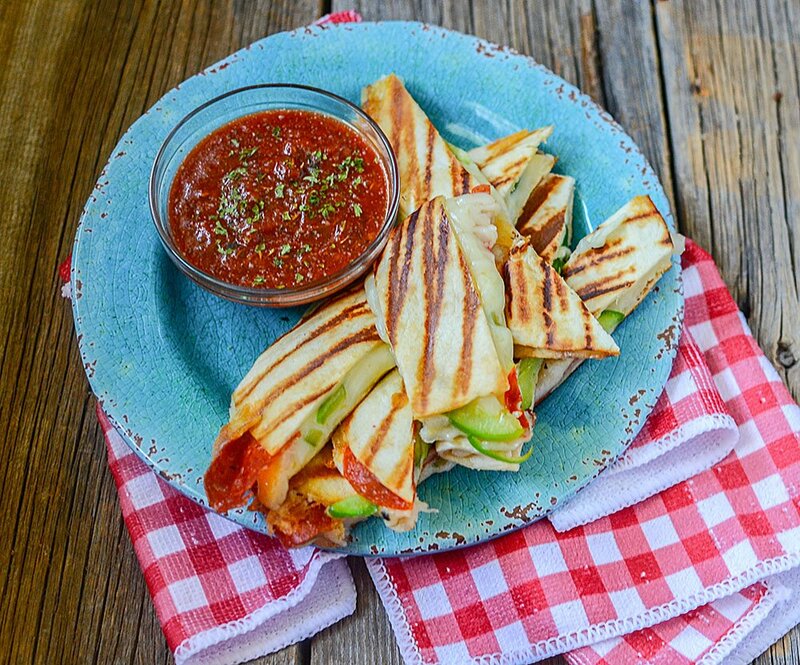 Cut the quesadilla into strips and let it cool slightly while you prepare the dipping sauce. In a small bowl, combine pizza sauce, or marinara sauce, or even spaghetti sauce will do in a pinch. If you’d like, add a bit of garlic powder, hot chili’s and/or Italian seasoning to the sauce to spice it up a bit more. What’s your favorite pizza toppings? Do you like anything out of the ordinary? Let us know down below so we can all read about it, and try them out! Thanks for stopping by! PIN THIS IMAGE TO YOUR PINTEREST BOARDS SO IT’S EASY TO GRAB THE RECIPE ANOTHER DAY! Can't decide between a pizza or a quesadilla? No worries, you don't have to. Make this dish and you can have the best of both worlds. You know, the way it should be. 2 tortillas, 6 - 8"
On one tortilla, place half the cheese, the green pepper, the pepperoni, and the remaining cheese. Cook for 2 - 4 minutes or until the cheese is beginning to melt and there is color developing on the bottom tortilla. Carefully turn the tortilla over to cook the other side. Leave it again 2 - 4 minutes or until the cheese is completely melted and there are grill marks on the other tortilla. Remove from heat, transfer to a plate, and slice into sticks. Let sit for 1 - 2 minutes. In a small bowl, combine the marinara sauce with the garlic powder and Italian seasoning. Dip the sticks into the marinara sauce and enjoy!